I was born and raised a few kilometers west of Paris and went to school a few blocks from where our tour was taking place in St Germain des Pres. 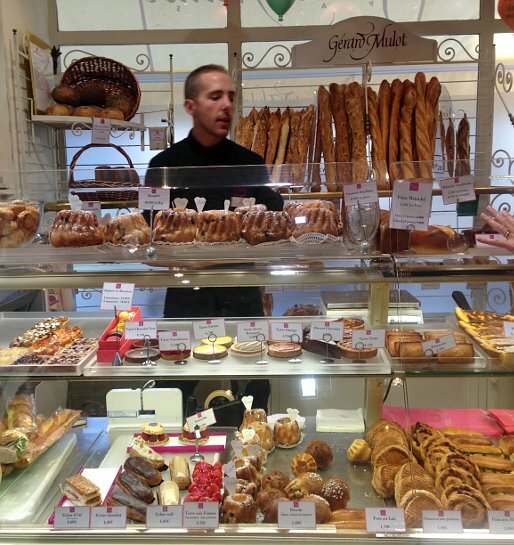 As a food enthusiast, I thought I knew everything about chocolate and pastries in Paris. However, after our Paris chocolate tour with Context Travel, I realized just how much I still had to learn! Learning about gourmet chocolate in Paris and visiting some of the most famous chocolate and pastry stores in the world is quite amazing. Chocolate lovers and pastry amateurs, get ready to enter a new world of sweet delights! 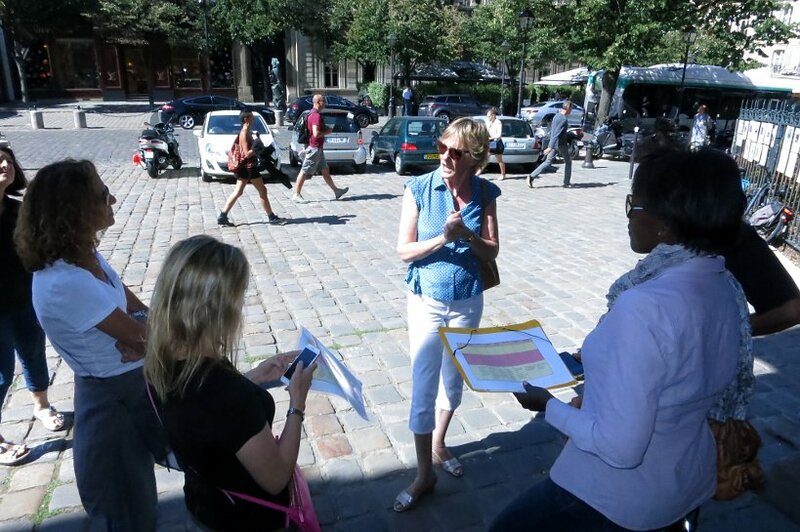 We met our guide, Jill Colonna, at 2pm on a sunny Friday afternoon in the left bank, at the entrance of St Germain des Pres church. While Jill is Scottish, she is married to a Corsican and has lived in France for over 24 years. 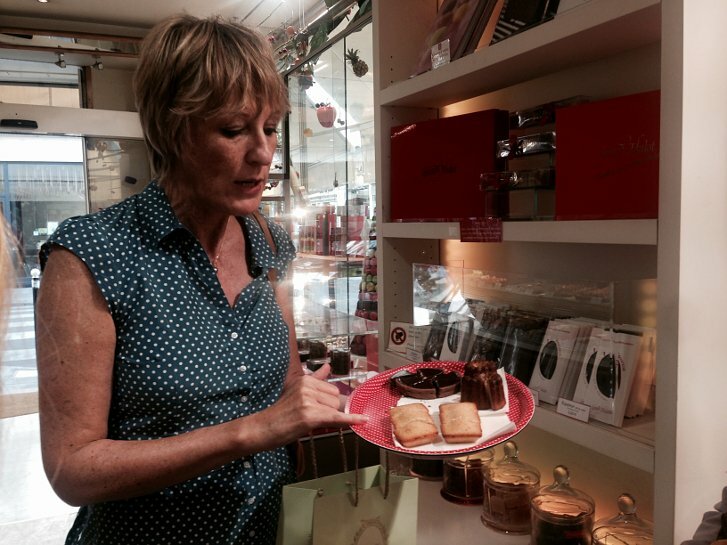 Right away, we were captivated by Jill’s enthusiasm and passion for French pastries. That’s when we learned that Jill is the author of two books – Teatime in Paris and Mad About Macarons. We knew then we were in for a treat (quite literally) and that we would enjoy the chocolates and pastries while learning about French culture. And with that, our small group of 6, including the two of us were off to our first stop. Imagine a time in France, when the only way to get chocolate was through the pharmacist. This was the case with Sulpice Debauve, who was the pharmacist to the King of France, Louis XVI and his wife, Marie-Antoinette. At the time, Marie-Antoinette suffered from intense headaches. The medicine given to treat the headaches unfortunately had a revolting taste. So, their pharmacist, Sulpice Debauve created a mix of butter and cacao to disguise the taste of the medicine. 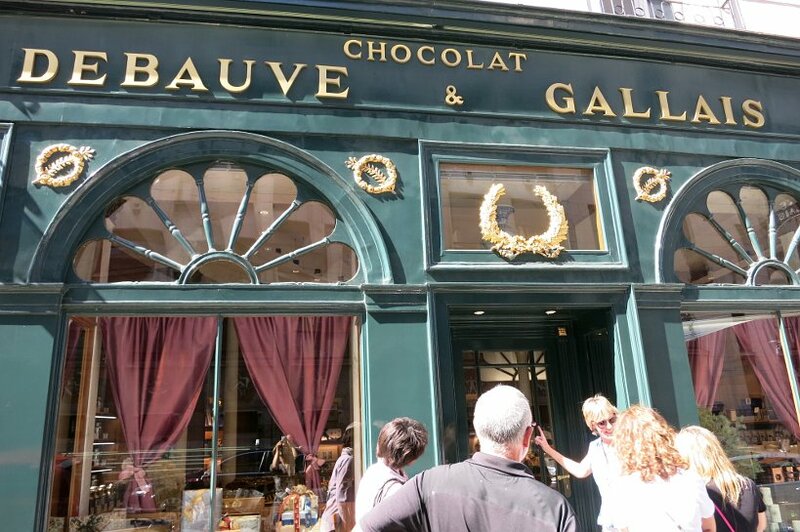 For our first stop on this Paris chocolate tour, we made our way to rue des St. Peres to the store that was built in the 1800. Walking into this old Parisian store is getting a taste of aristocracy, the noble class of old France. The chocolates are lined up preciously and each piece is handled with white-gloves. 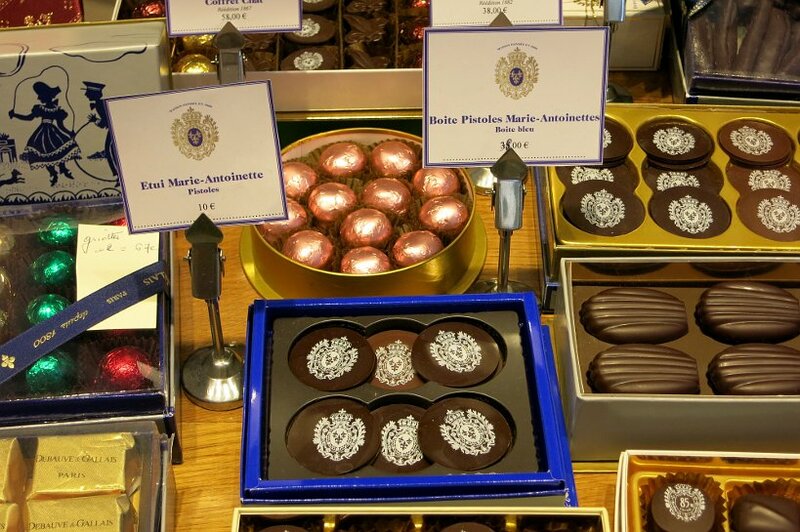 Here, we sampled the “pistoles” and pieces of exquisite dark gourmet chocolate. Referred to as “chocolatier de luxe” for more than 200 years, this is the perfect start to sample the history of chocolates in France. When you think about France, one of the most popular pastries that probably comes to mind is the macaron. As such, a Paris Chocolate Tour would not be complete without a visit to Ladurée, the largest macaron house in the world. 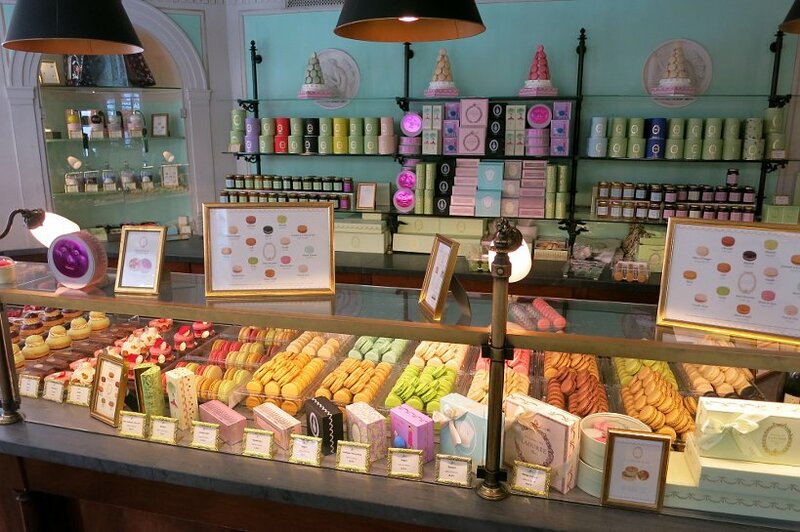 On Rue Bonaparte, you will find this particular Ladurée store, with a tea salon and restaurant in the back. 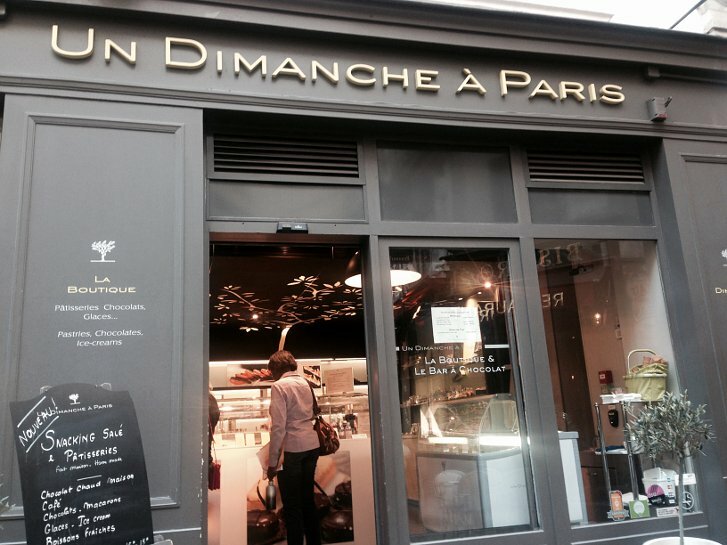 This is a great place to take a break and try this iconic pastry, away from the busy Parisian streets. For those not familiar, the macaron is made of two delicate meringue almond shells joined together with a creamy ganache filling. 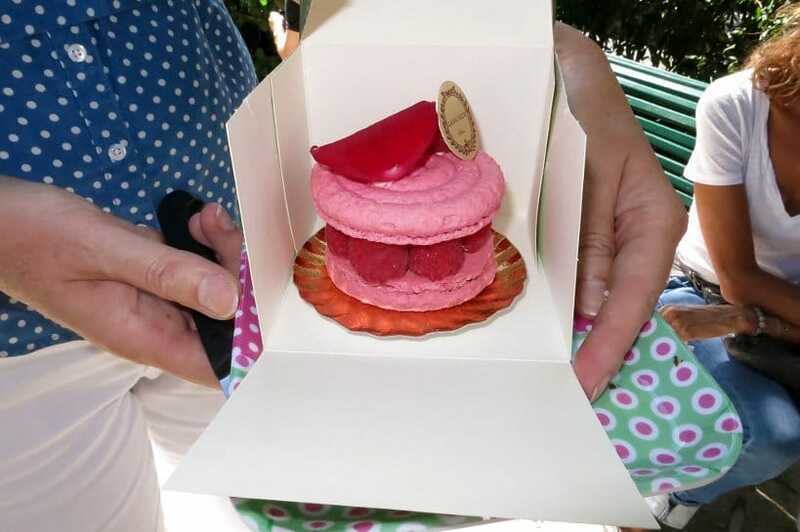 Beyond the macaron, the highlight of this stop was to try the magnificent Ispahan. This creation is from Pierre Hermé, one of the most renowned and celebrated French patissier. The Ispahan is a work of art. Beautiful to look at and exquisite in taste. It is made with fresh raspberries in a macaron like raspberry shell, lychees and rose petal buttercream. Finished with a rose petal on top and a drop of sugar to imitate the dew. I have always been amazed how the French can dedicate their stores to just one craft. Here we’re talking about Cream Puffs or Choux a la Creme. That’s right, a store that sells only Cream Puffs! Nested in a quiet and charming street in the 6th, La Maison du Chou is a cute and simple store dedicated to Cream Puffs. 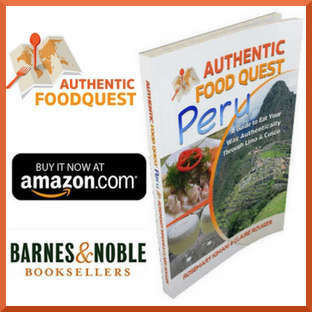 Created by Manuel Martinez, a MOF, you have the choice to order Cream Puffs that are either chocolate, caramel, praline or the classic, custard. Wonder what is a MOF? A MOF is a Meilleur Ouvrier de France. It is an award from a craftsmen competition in France held every four years. Similar to the Olympics, the designation is given to the best craftsmen (and women) and it remains unique in the world. 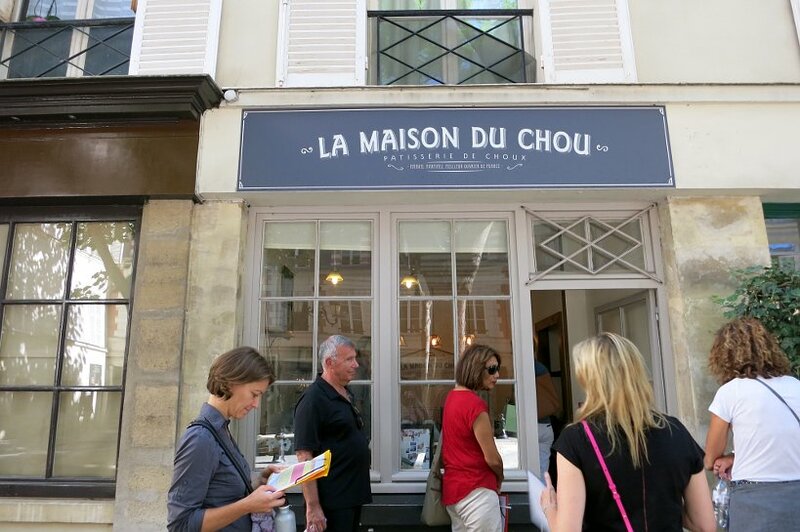 In the subdued decor of La Maison du Chou, we enjoyed our cream puffs with a drink of water before heading to our next stop on the Paris Chocolate Tour. Unlike some of the other stores we visited on the tour, this is an unpretentious store filled with locals. Seeking something different from macarons and chocolates, Jill steered us to Mulot’s other famous French pastries. We tried the Financier (small French almond cake), Tartelette au Chocolat (chocolate tart) and Le canelé (small French pastry in the shape of a cylinder filled with soft custard and dark thick caramelized crust). Getting stuffed with all the sweets and deliciousness, we all braced ourselves for the next stop on the tour. 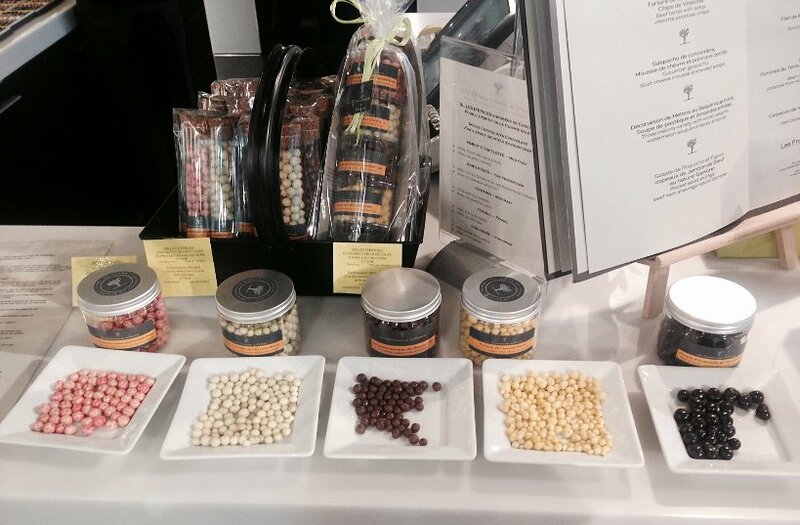 At Pierre Marcolini, gourmet chocolate is treated like a luxury wine. A passionate Belgian chocolatier, Marcolini redefines how to make chocolate, by treating cacao like a wine grape. Each cacao seed has a specific origin and terroir which produces chocolate with a unique taste and vintage. 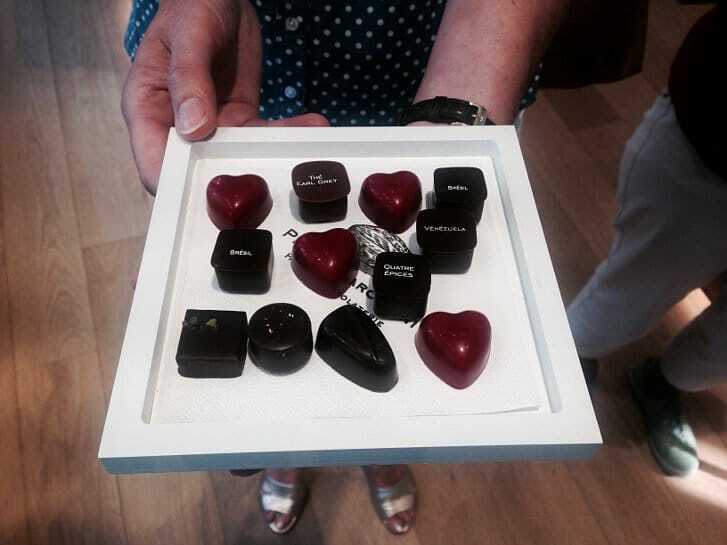 The iconic gourmet chocolate is the Raspberry Heart. It is a dark-chocolate ganache with raspberry bits and lemon zest. Rosemary and I are not fans of fruity chocolate, so we turned our attention to the delicious dark chocolate varieties with spices or almond flavors. From the outside, it is difficult to know what to expect from Patrick Roger. 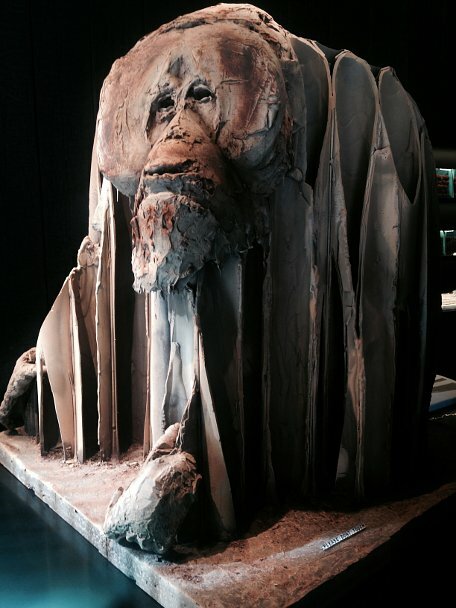 The only thing you might notice is this unbelievable large monkey statue sculpted in chocolate. Quite impressive and surreal! Once you walk inside, you noticed the modern feel of the counters which create a unique visual and geometric effect. This is not a typical chocolate store, but rather an art museum. Chocolate pieces are elevated to works of art, which intrigue and capture the imagination. The taste of this gourmet chocolate itself is unique. We tried one dark chocolate with jasmine flavor. And another dark chocolate with basil and lime. Distinctive and simply exquisite. Visiting Patrick Roger is a one-of-a-kind experience. Located near Le Procope, the oldest cafe in Paris that was built in 1686 and where Benjamin Franklin was a regular. This “down to earth” modern and very large store (for Paris standards) has a restaurant in the back and a preparation room where you can see the pastry chef and students busy at work. Here, we tried a gluten-free figue desert and the tart meringue citron. Both were light and incredibly delicious. One of the most surprising discoveries was the billes d’epices au chocolat. 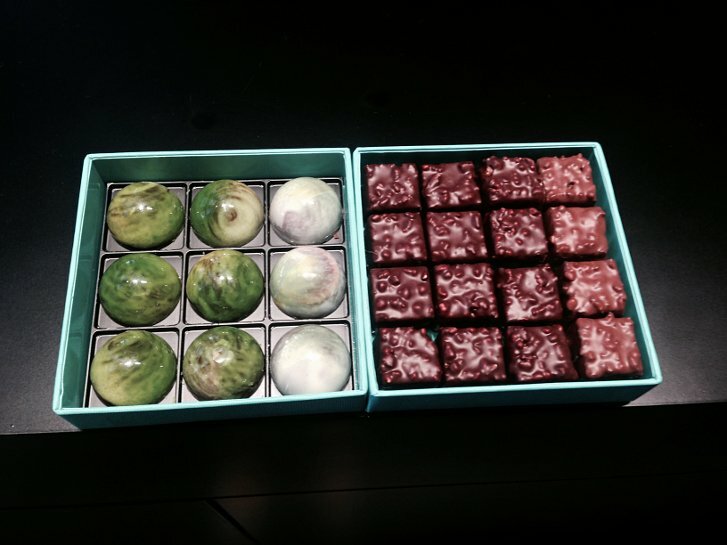 These are small little round balls of chocolates made to be eaten with meals. 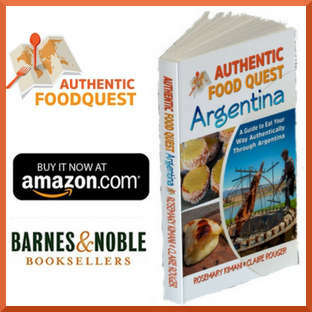 Some flavors are made to be eaten with lamb, beef and even foie gras. Quite an original and tasty concept. The Paris chocolate tour led by Context Travel took our chocolate experience to a new level, combining art and gastronomy. If you are looking for a unique experience on your next trip to Paris, consider a Paris chocolate tour and visit the most celebrated chocolatiers in the world. 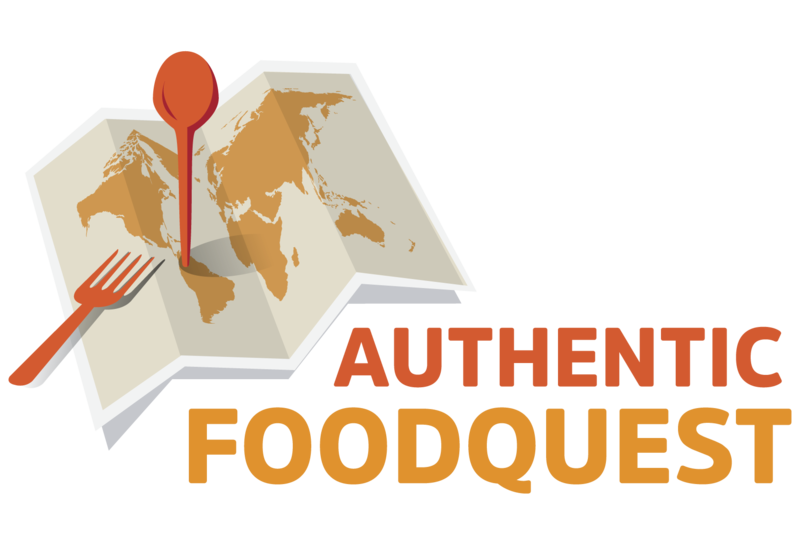 Eating your way through the seven different stores will prove to be surprisingly “difficult”. Luckily, Jill had warned us in advance and made sure we had only small bites at each store. Be sure to bring water with you as you will need it to rehydrate and clean your palate for each new visit. If gourmet chocolate is your not your thing, Context Travel also offers tours for wine lovers, cheese lovers and Paris market walks. There is no better way to spend an afternoon learning more about French gastronomy and delicious treats. And, if after all of this eating you feel inspired to work out, Context Travel also offers a running tour of the city. Bring your runnings shoes and discover the city from a different perspective, while keeping fit! Special thanks to Context Travel for having us on this Paris chocolate tour. All views and opinions expressed are our own. Full belly and happy taste buds as well. Wow a chocolate tour! Now that’s right up my ally. Everything looks so good. Very envious of this experience. The next time you find yourself in Paris, be sure to take the tour with Context Travel…it is absolutely worth the experience 🙂 Cheers! My goodness! Now this is a tour to do! 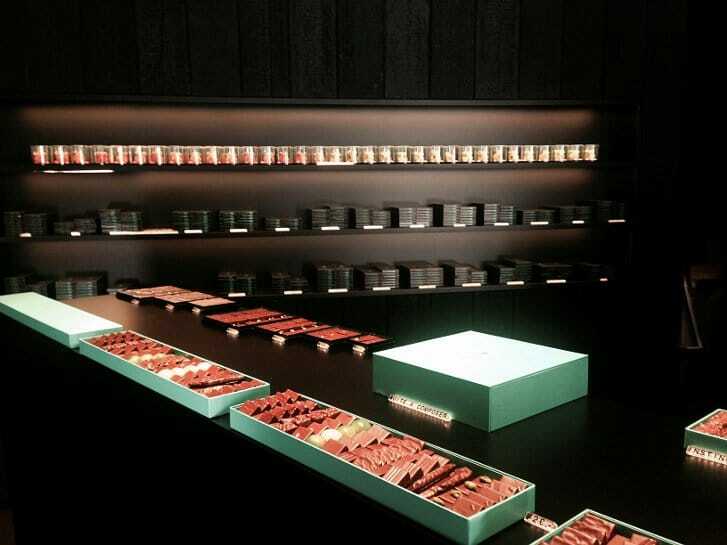 Ladurée looks amazing. I think I’d end up coming home with a suitcase full of chocolate! It’s true Nadia, it is easy to come home with several suitcases of chocolates…everything is so delicious 🙂 Thanks for your comments. All I can say is YUMM! I’d love to take a chocolate tour in paris and Laduree’s macaroons seem absolutely heavenly! I may have to try this on my next trip to Paris. Good tip about bringing water to clean your palette. Yes, indeed Erika, be sure to take the chocolate tour in Paris. All the stops including Laduree are amazing! Prepare to go to chocolate heaven and do bring your water with you. Let us know when you go to Paris. Paris and chocolate, I’m there! The macarons are awesome; actually they look too good to eat. A foodie holiday in Paris is such a wonderful way to travel. Those photos are making me hungry. Oh my goodness, I think I need to go to Paris just to go on this tour! Look at all those beautiful sweet treats, amazing. 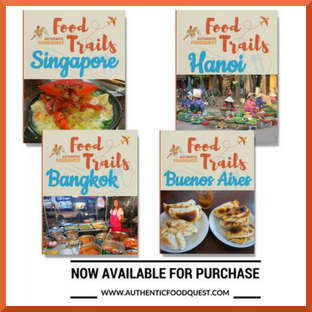 This looks like a delicious tour! France has some seriously amazing chocolates. I’m living in Bordeaux and there are at least 100 different chocolate shops, but sadly, no chocolate tours. I want to pop up to Paris on the train though just for those wine chocolates. They sound incredible! 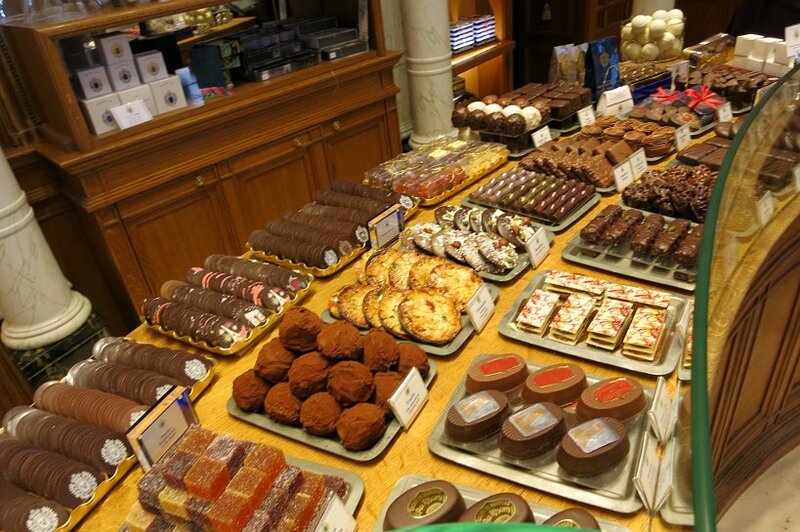 Hi Jennifer, given that you are already in France, it is absolutely worth taking the chocolate tour in Paris. Let us know if you make it on your next trip to Paris! Cheers! Yeah well I know what I am doing my next time in Paris, I gained 2 pounds just looking at all your pics 🙂 I think I would love Patrick Roger, very creative. Sweet idea! I go to Paris very often and this a great thing to do for my next trip there later in the year. Ladurée is also very popular here in London and so are other macaron places. Perfect Hugo, you will love the chocolate tour with Context Travel. Let us know what you think after your next trip to Paris. Thanks for your comments. That’s wonderful that you know Jill. Great tour guide and very knowledgeable. Be sure to check it out on your next trip to Paris. Cheers! I always said Paris is a City I don´t need to see a second time….I guess I am wrong! I am a chocoholic! After seeing all those beautiful pictures, I feel the urge to put it back on my bucket list! Oh yes….this tour alone is worth putting Paris back on your bucket list. Even after living in Paris for so many years, I found a new appreciation for the city and the history of chocolate. Thanks Pat for your comments. Given that you are already a Paris fan, this tour will take your experience in the city of lights to a new level. Let us know when you think the next time you visit Paris. Thanks Yang! I need a good chocolate right now!! 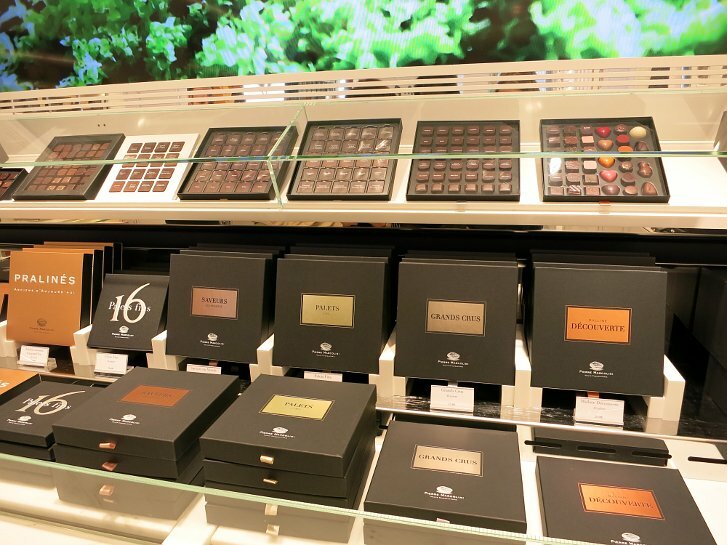 Paris is awesome, gourmet chocolate is delicious, together they are the ultimate mouthwatering and artistic experience. Love it! You could spent a day in Paris at the Louvre, or Eiffel Tower, but honestly, could it be any better than treating yourself to Parisian pastries all day…I don’t think so. I would probably end up eating my weight in macaroons! The temptation to eat your weight in chocolate and macarons is incredibly “real.” One surprising effect after the tour is that we did not get a “sugar high.” That definitively speaks to the great quality of raw products. So, eat and walk off the calories in the city. Not a bad plan, don’t you think? Cheers! If you and your boyfriend love chocolates…this tour is for you! Check it out the next time you are in Paris. Appreciate your comments! 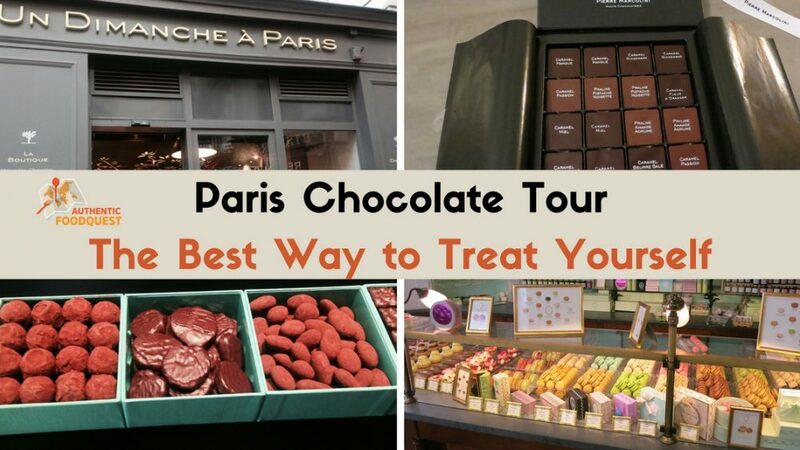 A chocolate tour of Paris sounds amazing in every way … the thing I love most about these kind of tours though is the fascinating history which you learn too. I had no idea about things like Marie-Antoinette having had her medicine coated in a chocolate paste! Really fascinating to pick up little tid bits of history like that. Wow, that is one very classy and delicious looking tour! The chocolate art is really incredible! Thanks Prateek, so glad you enjoyed reading about the tour. The creativity by the different chocolatiers is quite incredible! A fun and amazing experience. 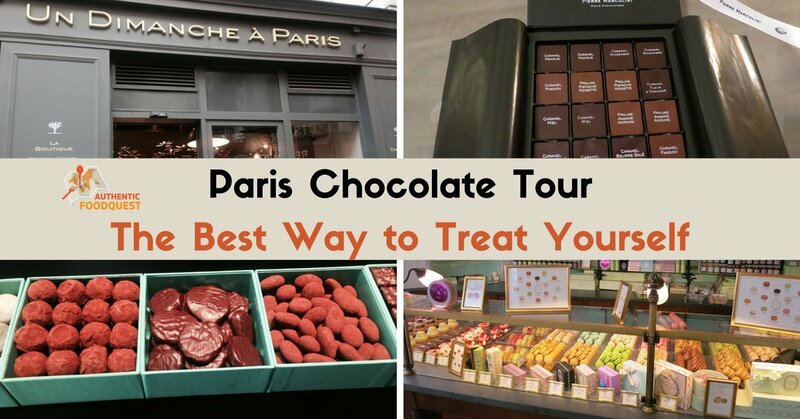 Agree 100%, chocolate is the cure for everything 🙂 Do indeed check out the tour the next time you are in Paris. Delicious and incredible experience. Thanks Colby for your comments. It was such a pleasure to have you on the tour (and to read this post, which is making our mouths water!). 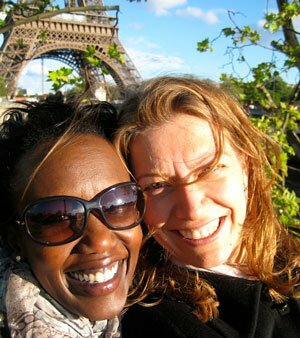 We’re so glad that you enjoyed Jill’s expertise and learning the secrets of Chocolate in Paris! We really enjoyed our experience on the chocolate tour as well as the expertise and depth from Jill. Thank you Context Travel for a fantastic time! That’s great to hear Amanda. 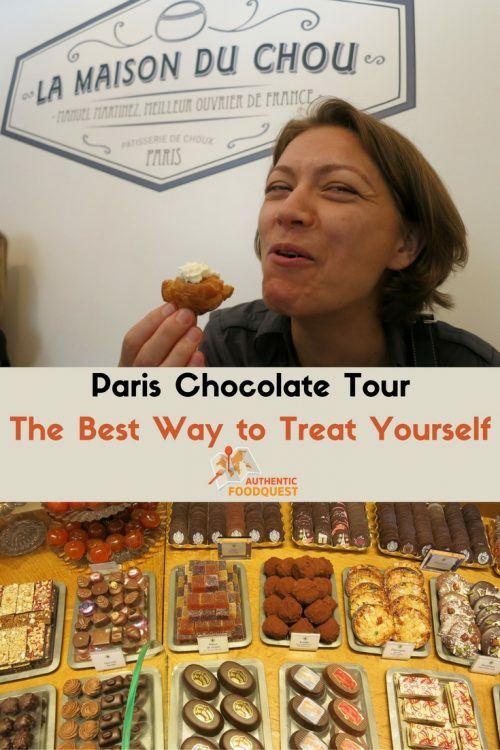 You will definitively enjoy the chocolate tour in Paris. Let us know what you think!! This all looks so amazing! I want to go now! I cannot thing of a more exciting time that a chocolate and pastry tour and in Paris of all places! I’ve only been to Paris once, but it was amazing! And the chocolate and pastries were superb. Hi Beth, if you found the chocolates and pastries amazing on your first trip to Paris, you would definitively enjoy this tour. 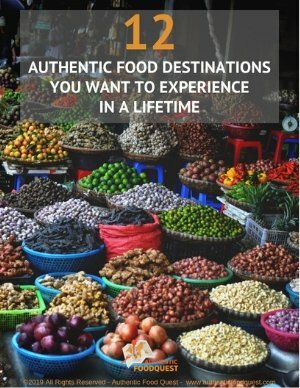 With Context Travel you get to visit really unique chocolatiers and indulge in pastries while learning about their history. Put this experience on your list for your next trip. Cheers! I promise I’m not even that much of a chocolate fan, but Paris and Brussels set me up! lol I was grabbing chocolates at any chance I could get. All self control was out of the window lol. That’s funny…”all self-control out the window”…lol!! That’s totally the experience on this amazing tour. Check it out the next time you are in Paris!! Thanks CJ for your comments.